Catholic leaders in the Central African Republic spoke of a humanitarian crisis and criticised attempts to fuel interreligious clashes in their nation. “Most have nothing left to eat and are sleeping outside on the ground – we’ve nothing left to give them and our parishes can’t cope,” Msgr Doumalo said. But Christian and Muslim leaders have urged their communities to remain calm and avoid branding people according to their religion. “Christians, Muslims and animists are engaged on both sides – it’s completely wrong to view this as a religious conflict,” added Msgr Doumalo. Under a UN mandate, a contingent of 1,600 French paratroopers began disarming militants from the rebel Seleka movement, after several days of communal fighting left at least 400 dead, many of them children. France’s Catholic La Croix daily reported earlier this week the French army appeared to have “underestimated the determination” of Seleka fighters, composed partly of Arab-speaking Islamists from neighbouring Chad and Sudan. The rebels suspended the constitution after ousting President Francois Bozize in March. The newspaper said there were fears of revenge attacks on suspected Seleka sympathisers by members of a pro-Bozize militia, Anti-Balaka, formed in September in Bozize’s northwestern home region. It also said residents feared if they welcomed French intervention, they would be subject to revenge attacks by Seleka remnants. Salesians based in Bangui spoke of similar fears and reported that, with an increase in violence in early December, they were sheltering more than 20,000 people in two centres. Father Jose Maria Saba, treasurer of the Salesian province of Equatorial Tropical Africa, wrote to confreres in the United States and expressed concern that there was no one to protect the people at the two centres. He said the Salesians would appeal to the international Catholic charity network, Caritas Internationalis, as soon as he could ascertain exactly what was needed. In a message released on December 7, Archbishop Dieudonne Nzapalainga of Bangui, the bishops’ conference president, said the current crisis had caused “chaos and barbarism,” adding that Church leaders deplored outrages by both Anti-Balaka and Seleka. However, it was wrong to suggest the two rival groups had a Christian or a Muslim character, Archbishop Nzapalainga said, adding that he condemned recent rival attacks on mosques and churches in Bangui. “We condemn every attempt at political recovery which aims at antagonizing Central Africans and setting them against each other under the pretext of religious affiliations,” the archbishop said in the message, co-signed by Bishop Nestor Nongo Aziagbia of Bossangoa, the conference’s vice president. “We forcefully reaffirm that interreligious violence and conflict contradict what we profess in our faith. We are all created in the image and likeness of God and destined for eternal salvation,” he said. Msgr Doumalo said that Archbishop Nzapalainga had inspected parts of the city earlier this week and offered to shelter Muslim refugees in his residence. However, he added that many residents were still afraid to return home, and said the Church’s Caritas charity was now over-stretched by humanitarian needs. “Many have lost everything, and the list of dead is still mounting here, so the church will need a lot of time to sensitise people to the requirements of peace and concord,” the bishops’ conference secretary-general said. 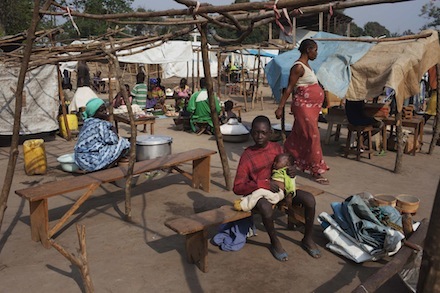 Catholics make up around a third of the 4.4 million inhabitants of the Central African Republic, one of the world’s poorest countries; Muslims are about a tenth of the population.